Splash into a world of excitement at Aquaventure Waterpark Dubai Experience the Middle East and Europe’s No. 1 water park, overflowing with 17 fun-filled hectares of adrenaline pumping fun. 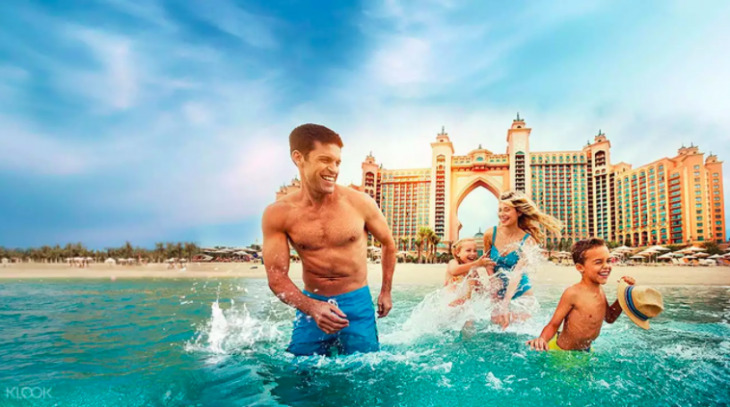 Get ready for a day filled with excitement at the Atlantis Aquaventure Water Park on Palm Jumeirah Island. Enjoy an array of thrilling rides that will push you to your limit, including Aquaconda, the world’s largest water slide that will catapult you and your friends on a wild ride and drop you into the largest fibreglass tube in the world! Grab a tube and ride the river that takes you on a journey through Aquaventure’s unique interconnecting waterways. Head to the Tower of Poseidon where you will experience record-breaking rides that plunge you into tanks with sharks and rays. Take a break from the rides to relax on the private beach, shop, or eat at one of the 15 restaurants available to you. Venture into the Lost Chambers Aquarium to surround yourself with sharks, stingray, piranhas, lobsters, and seahorses in a maze of underwater glass tunnels. With an all-day full access pass and activities for all ages, there is no better way to spend a hot day in the desert! By taxi: Aquaventure Water Park is a 25 minute drive from Deira (city centre of Dubai).